What is the Virgin TellyTablet? It’s a tablet from Virgin, made for watching TV. Were you honestly expecting anything else? The Virgin TellyTablet was a surprise move by the company, who launched the Virgin V6 4K TiVo box at the same time. The point of this device is to be a sort of missing link, for when someone is hogging the TV and you don’t want to watch your film or show on your laptop. It may not be of interest to people who already own a big tablet. But for those without a tablet, or for those who own half-size tablets, the TellyTablet may be an excellent viewing device. Basically, it’s a massive tablet that wants to be your TV. Its 14-inch screen is bigger than that of the TV I grew up playing videogames on. The only bigger tablet we’ve seen is the 18-inch Samsung Galaxy View. A screen this big needs to be plenty sharp, and thankfully the IPS panel comes armed with a Full HD resolution (1920 x 1080 pixels). On the audio front Virgin has provided four speakers, positioned at the front and rear. Also at the rear is a half-circular kickstand. Whether you have it open or closed, the stand section sticks out from the device a little instead of sitting flush with the rest of the tablet. It’s not especially neat, but it does mean the back speakers are given a little space if you decide to lay it flat on a table. The build quality seems strong: there’s a lot of plastic, but it’s sturdy. The TellyTablet reminds me a little of the Surface Pro tablets, which also have a 16:9 aspect ratio. The right edge has the usual power and volume buttons, while the left edge has all the connections. You get a 3.5mm headphone jack, a Micro USB port, and two USB sockets that work with keyboards, mice and memory sticks. There’s also a microSD card slot, in case you want to supplement the built-in 32GB of storage. Sadly that Micro USB port is just for PC connection. For charging, you’re stuck with a DC plug. I don’t remember the last time I charged a portable device with a DC plug. At least the tablet has a whopping 12,060mAh battery, which Virgin claims will last up to eight hours in playback, or three days on standby. There is no rear camera. I’m fine with that, because I reckon you’d look ridiculous taking snaps with a slab this big. For video calls, there’s a 5-megapixel front camera with autofocus. 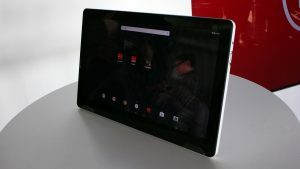 I can’t say much about the tablet’s performance just yet, given my limited hands-on time and the fact that it wasn’t connected to a Virgin V6 box. The tablet can play video from other sources, but given this is a Virgin device I reckon it ought to be tested specifically playing recordings captured on a V6 and played back through the TV Anywhere app. That being said, the TellyTablet seemed responsive to swipes and touches, and the menu icons looked pretty sharp. I’ll be reporting back next week once I’ve had a chance to see the TellyTablet running video and audio. Stay tuned. I think the Virgin TellyTablet is a good idea. There are plenty of occasions when I want to watch TV in bed or in the kitchen and I don’t want to start up the laptop – and this seems to fit the bill. Its large screen is appealing, as is the above-average number of speakers. Provided its video performance (with and without a Virgin V6 TiVo box) is up to scratch, I can see this being an excellent addition to your home’s entertainment system. The post Virgin TellyTablet appeared first on Trusted Reviews.